I know October seems way too early to be worrying about Christmastime and holiday budgets, but it’s only a couple of short months away. Christmas will be here before we know it! If you haven’t saved up money to help with your Christmas gift-giving, there’s still plenty of time to avoid going into debt for the holidays. Even though Halloween hasn’t quite reached us yet, it’s never too early to start planning for a budget-friendly Christmas. The earlier you start, the better off you’ll be. 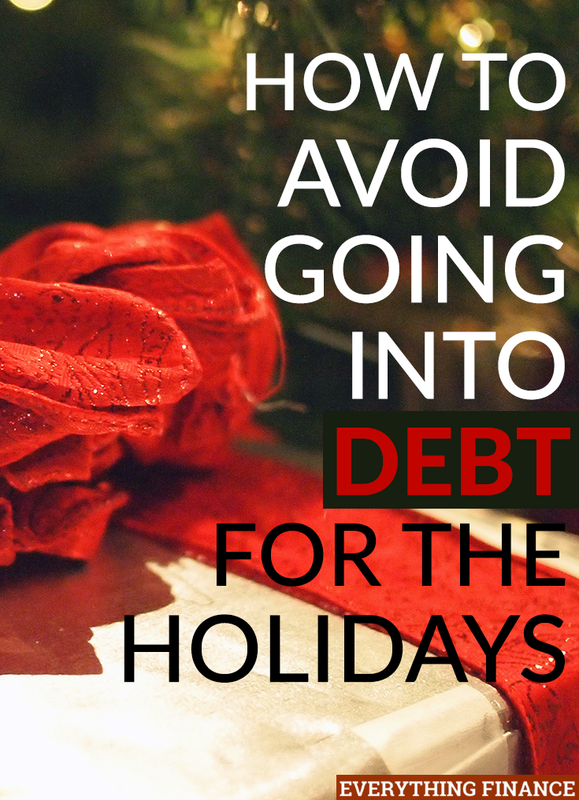 Here are a 5 tips on how to avoid debt for the holidays. For years, I endlessly worried about purchasing the perfect gifts for my loved ones while on a budget. I always wanted to spend more than I should, and it’s easy to blow a lot of money on gifts the closer it gets to the holidays. You want to get your shopping done! The whole idea is incredibly unsavory to me. I reminded myself a few years ago how much I hated it when I went on an all-night shopping binge with a friend on Black Friday. I love my friend, but I hated the experience of shopping for so many hours in the middle of the night, which resulted in me sleeping away half of the next day. Why did I voluntarily do that?! I knew better. You don’t have to wait for Black Friday to get the best deals. In fact, the best deals aren’t available on Black Friday anyway — they’re sprinkled throughout the year when you stumble upon the perfect gift for each person on your list. Not when because you see something on sale on Black Friday that you think they might like. If you’re like me, the longer you wait to pick out your gifts, the more likely you are to splurge on something outside of your budget. You might panic and spend more than you normally would on a particular item, just to get it checked off your list. I know I’ve done that. Now, I try to shop as much ahead of time as I can. That means if I spot the perfect gift for my brother in July, I’ll grab it and store it for a few months until Christmas comes around. I love doing this! I even keep a small basket in the bottom of my closet for random gifts I’ve picked up throughout the year and am saving for Christmas. It’s a great way to spread out your gift purchases so you don’t feel such a budget strain when December finally rolls around. Not to mention it feels wonderful to have most of your Christmas shopping done by the time all those holiday commercials start popping up. I also keep a running list year-round of items I think my loved ones might like or items they’ve mentioned wanting. Next to the item, I write how much I’m spending on them or that particular item, which helps me keep my spending in check. Big family celebrations where tons of gifts are exchanged is the norm for many families. It can lead to unnecessary financial strain for some, which isn’t exactly what the season is meant for. I’d also be willing to bet that none of your loved ones would want to cause you any financial stress over a gift you gave them. I know it’s hard to be the person in your family who steps up and finally says, “Enough is enough,” but it’s okay to talk to your family about forgoing gift giving this year, or at least taking it down a notch. How often do you get something as a gift that you wouldn’t buy for yourself? How many gifts have you given to people that they probably didn’t care for or use? I hate to think about it! Instead of a gigantic gift exchange, be the person who suggests choosing an outing or event you can all attend to create a memory. Have fun. Be merry. Take pictures. No gifts involved, just memory-making. It’s okay to be the person who challenges your family’s tradition. You might be thankful you did — and others may be, too. If you’re good at making something, share your gift. Whether it’s sewing, soap-making, baking, painting, writing heartfelt letters, or something else, turn your favorite hobby into a gift you can give out. Share your talent. Handmade gifts are more personal and require an investment of your time more than your money, which absolutely makes them more meaningful. A handmade gift you actually enjoyed making gives the receiver the message that you were thinking of them while creating something unique for them. Your mom may not remember the pair of boots you bought her 2 Christmases ago, but she will likely cherish a letter that you gave her detailing your favorite childhood memories of things you did together. Don’t underestimate the value of gifting your time or services to someone who would love to have them. Gifting services is a great idea if you have no extra money to spend on gifts. If you’re a broke college student or simply working hard to pay off your debt, gifting a service is the way to go. Some ideas to use are to offer to visit an elderly family member (they absolutely want your company more than a gift), clean a relative’s house, or babysit for a mom and dad so they can have a date night. (As a mom, I’m telling you, that’s the best gift ever!) Sometimes it really doesn’t take much — maybe a few hours of your time. Christmas doesn’t have to result in feelings of panic or dread by the time you get your credit card bill in January. That’s a foolish way to celebrate the holidays. Your loved ones don’t want to cause that kind of hardship for you, so don’t feel like you have to spend a mint to get them an extravagant gift. They probably won’t even remember it by next year anyway! What’s the earliest you’ve ever started planning your Christmas gifts? What ways do you save money on your Christmas shopping list? How to you avoid getting into debt during the holidays? I don’t either, but people do it all the time! I agree. I am definitely going to challenge my family to do this and only buy a handful of small gifts compared to the loads they bought last year.